Contrary to popular belief, it is possible to have non-gooey okra. These little guys are what finally got me to cross over into the land of the okra-lover. Crispy and spicy, they rarely make the short distance from the counter to the kitchen table and have become one of our favorite summer snacks. 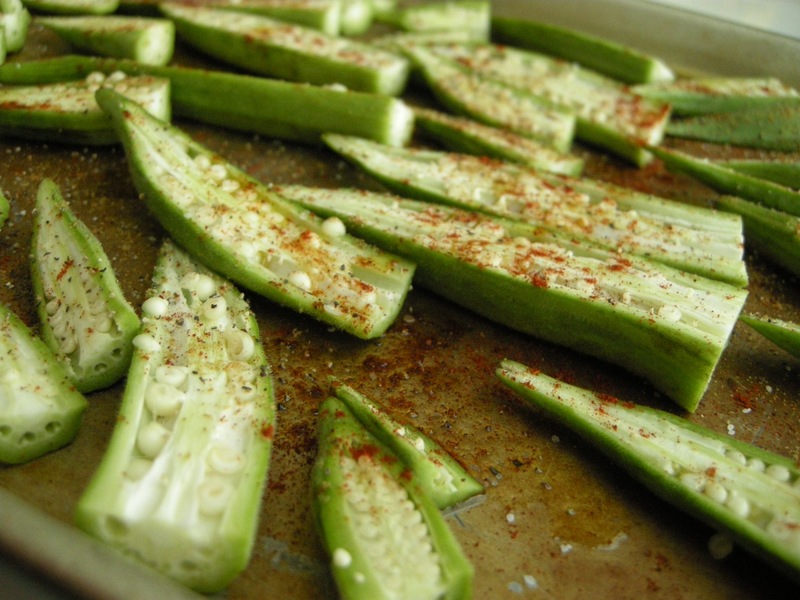 Yes… okra can be a snack! Slice stems off okra and then cut lengthwise. Toss okra in olive oil. Spread on baking sheet with cut side up. Sprinkle spices on as conservatively/liberally as your palette would like. Place baking sheet on lowest rack in oven and bake until crispy. Approximately 20-25 minutes. If perchance, they don’t get eaten up right out of the oven, they make a wonderful side to veggie burgers and/or summer veggie sandwiches. This crispy okra sounds incredible. I do like the sliminess of stewed okra, but this sounds different and really good!